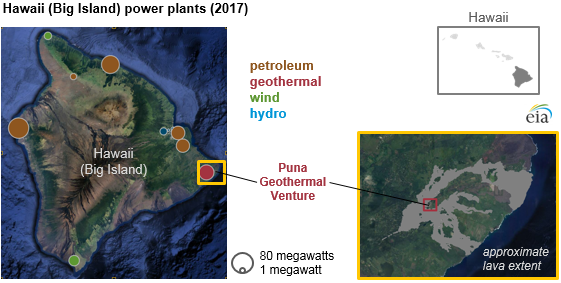 Lava flows from the Kilauea volcano on the island of Hawaii led to the shutdown of the Puna Geothermal Venture (PGV) power plant on May 3, 2018. The 38-megawatt (MW) facility is the only geothermal plant on the island, and it produced about 29% of the island’s electricity generation in 2017. The plant voluntarily ceased operations ahead of the approaching lava flow. Continuing eruptions in lower Puna, the southeastern corner of the island, have damaged transmission lines and equipment, and local residences are experiencing extended power outages. The island’s utility, Hawaii Electric Light Co (HELCO), has implemented switching operations to reroute power from its nearby plants to customers in undamaged areas of lower Puna. PGV is a geothermal plant drawing steam and hot geothermal fluid up through 11 production wells drilled 6,000 feet to 8,000 feet deep. Pressurized steam from the hot fluid, along with non-condensable gases, is routed through the facility to drive a turbine generator that produces electricity. Exhaust steam from the turbine is used to vaporize a working fluid, which drives a second turbine that generates additional electricity. The remaining steam (along with geothermal fluid) is reinjected into the ground through reinjection wells. Plant operators quenched 10 of the 11 geothermal wells to prevent them from releasing gases. Quenching involves injecting the well with water to cool and depressurize it. The 11th well was plugged with bentonite clay after quenching efforts were unsuccessful. Two of the capped geothermal wells, identified as KS-5 and KS-6, were covered by lava from the Kilauea fissures in late May. A transmission substation and a warehouse containing a drilling rig were also destroyed by the lava flows. PGV's generating capacity of 25 MW when it opened in 1993 was expanded to 30 MW in 1995 and then to 38 MW in 2012. In March 2018, the facility owner announced plans to increase capacity to 46 MW by 2020. The plant is the largest renewable power plant on the island. 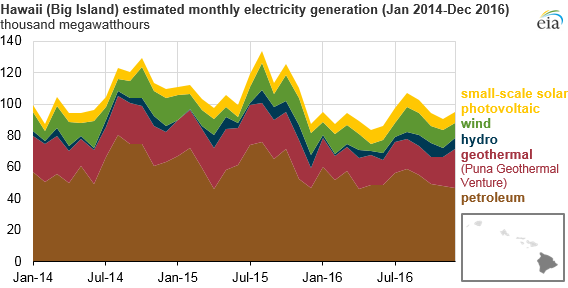 More than half of the island’s power generation mix is fueled by petroleum, based on EIA data for 2016. The remaining 44% is from various renewable sources. Of these, geothermal (20% of the island’s generation mix) is the largest, followed by wind (11%), small-scale solar photovoltaic (9%), and hydropower (5%). Note: Hawaii (Big Island) small-scale solar photovoltaic generation based on the island’s share of the state total customer-sited solar capacity.